We (Christians) will all stand before the “Judgment seat of Christ” and give an account of our life. Our reward and losses would be based on many things including our words, works and motives. But the call/invitation to reign with Him in the age to come would be majorly based on who we become (maturity) in this age (i.e. becoming like Jesus). Peter said, EVERYTHING we need to live a godly lifestyle has already been given to us. He’s like all you’ll need to grow to become like Jesus (in character) in this world has been made available to you. We find this through knowing Jesus and His promises/instructional word. READ 2 Peter 1:3-11. Peter goes on to talk about the things we can add to our faith and if we possess them in matured measure we would NEVER stumble (sin) and we would receive RICH welcome in God’s Kingdom. Jesus’ sermon on the mount greatly expounded on the short list Peter mentioned. Mike Bickle breaks down the Sermon on the mount in this way. 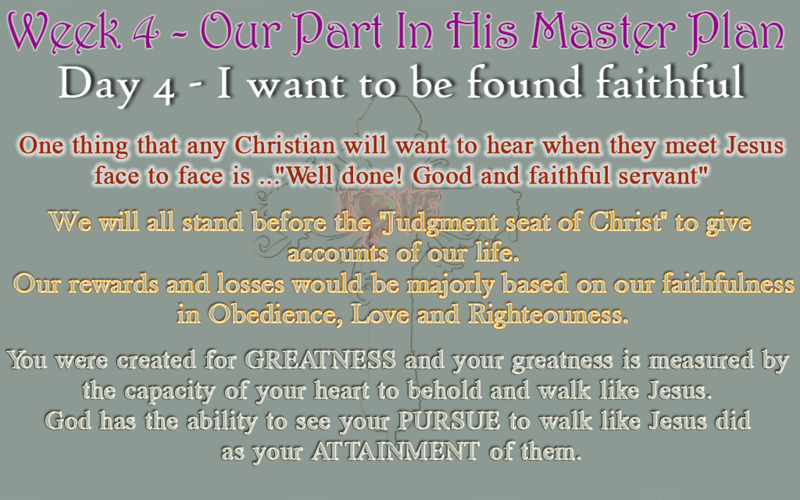 ★ PURSUE 5 KINGDOM ACTIVITIES (6:1-20) that position our hearts to freely receive more grace. Mikebickle.org has some amazing teaching on them. It’s under Kingdom life category. We are all going to be shocked (some more than others) at the Judgement Seat Of Christ about the rewards we will gain and the losses we will suffer mainly cos God does not judge things as we do. It’s important to note that the setting of your heart to pursue 100-fold obedience (humility, love & faithfulness) is not and does not mean your attainment of them. Jesus, Paul, Peter & John all said as believers we can live godly lives and NEVER stumble (sin), which means, that’s the goal and it is attainable. At the end of David’s life, the Bible says he did and followed ALL the ways of the Lord. In fact God himself said that of Him; A man after my own heart who will do EVERYTHING I require of him. But I’m sure we can all recall on several occasions where David did not entirely followed the ways of God. God has the ability to see your pursue of Him as your attainment of it. OneThing that can be said of David is that he had a heart that pursues God in spite of his failures and shortcomings. You were created for GREATNESS and your greatness is measured by the capacity of your heart to behold and walk like Jesus. Is this an impossible task? Well be of good cheer and know that God will NEVER ask something of you if He knows you couldn’t do it. God’s GRACE is in His commands. Everything that goes into a life of pleasing God has been miraculously given to us by getting to know, personally and intimately, the One who invited us to God. The best invitation we ever received!…Don’t put it off; do it now. Do this, and you’ll have your life on a firm footing, the streets paved and the way wide open into the eternal kingdom of our Master and Savior, Jesus Christ.